If tourists from all over the world choose Vietnam as a vacation escape, they should not miss paying a visit to Danang, which is the worthiest-living destination in Vietnam. Owning a lot of diverse natural scenery, Danang attracts tourists not only to its extensive beach sprawling over more than 60 kilometers in length which was selected by Forbes magazine as one of the six most attractive beaches on the planet but also other breathtaking attractions such as Ba Na Hills, Son Tra Peninsula, Ngu Hanh Son and so on. Recently Danang has been famous for its new tourist destination, the“ Cau Vang Bridge” or the Golden Bridge Danang which became the most iconic and most-hyped landmark of Vietnam in recent times after its public opening last June. 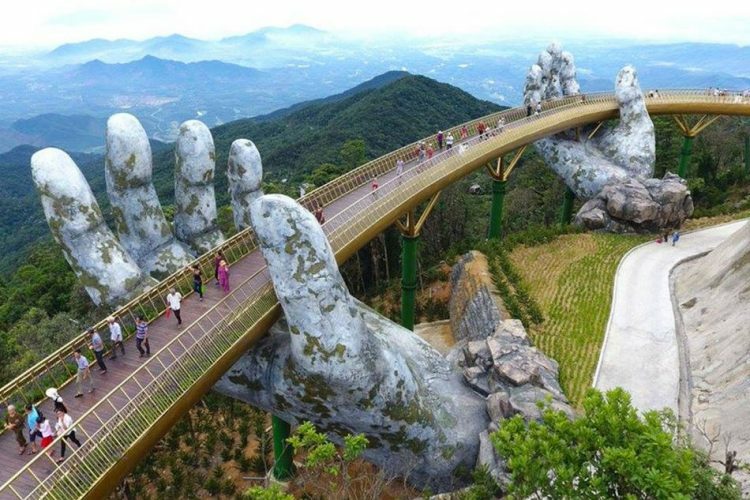 Golden Bridge in Vietnam, an incredible structure to enhance the face of Vietnam tourism in global platform, was opened in June 2018 at Ba Na Hills Resort on Truong Son Mountains. Stretching across the mountain, the two ends of this bridge are touching Marseille Station and the Tiantai Gardens at Le Jardin d’Amour. The well-known fairy tale themed French colonial village, Ba Na Hills now appears to be more reputational and magical, and thanks to this amazing bridge. Ticket price: The fare includes two-way cable cars, mountain trains, wine cellars, Le Jardin gardens and most games in Fantasy Park. – Entrance fee for adults and children more than 13m in height: VND 700,000/person; for Danang residents: VND 400,000/person. – Children from 1m – 13m in height: VND 550,000; for Danang residents: VND 300,000. For Danang people, when purchasing tickets, they need to present permanent documents in Danang. For children, they must bring birth certificates. Golden Bridge Danang has been designed by TA Landscape Architecture and is completed within a year. Danang is no stranger to the world when it comes to unique bridge designs such as the Han River bridge, which is Vietnam’s first swing bridge; the Dragon Bridge that breathes water and fire on every Saturday and Sunday night or Thuan Phuoc bridge which is the country’s longest suspension one. Therefore, it wouldprobably be no surprise when Danang is gifted with a new bridge. However, with the combination of unique design and poetic scenery around, two gigantic stone hands holding the Golden Bridge actually wonderstruck the entire world at the first sight and you may not stop uttering “ Wow, amazing!”. The Golden Bridge Danang has been built at over 1400 meters above sea level, with a total length of 148.6 meters, and was divided into eight spans, of which the longest span was 21.2 meters. As a walking bridge, the Danang Golden Bridge possesses a 3-meter spherical surface with a spherical timber material of 5 cm thick that allows you to play and dance. The special name of the bridge has been derived from its guardrails painted in shimmering gold. 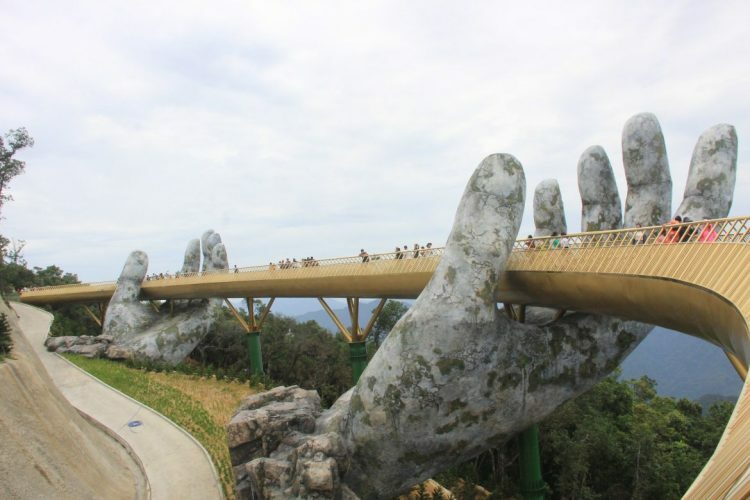 Golden Bridge Danang is a footbridge that seems to be lifted by two huge hands of god. It is firmly made from two giant mossy stones which have been shaped as hands. This abstract design makes the bridge match the theme of the scenery around. Furthermore, thanks to its great height, Danang Golden Bridge is like a silk crossing the sky to help to touch the flying clouds. Located amid the picturesque backdrop of Sunworld Ba Na Hills Danang, the Golden Hand Bridge Danang evokes a sense of walking down the mesmerizing way of paradise. No matter how people imagine about this bridge, it is undeniable that Golden Bridge is one of the most spectacula rand magnificent sites to visit in Vietnam. Besides enjoying the 360 degree view of mountainscape and valleys from a great height, have you ever considered whether you can use this bridge for other purposes? After inauguration in June 2018,, Golden Bridge was first used as a special runway for London’s prestigious fashion show to introduce a new collection of A Sai Ta, a Vietnamese-Chinese designer, who was chosen as top 100 people having a big impact on Indochinese culture. The famous art director, Long Kan invited A Sai Ta to Vietnam, and while sharing his emotions, A Sai Ta said: “When I see the Golden Bridge amidst natural space, I seem to be mesmerized because it is so beautiful. I’m excited to see my costumes shown up in such a place.” Models in fabulous bridal gowns catwalk through the foggy and mystical backdrop and , it definitely invokes the feel of walking in the sky. The name of the show “A Walk To The Sky” presents exactly the same ambiance and feelings for anyone walking over the famous Golden Bridge Danang.. The keyword “Danang Golden” not only maintain the top position of the most searched keyword on Google, but many international press and media channels give it a ton of positive comments. 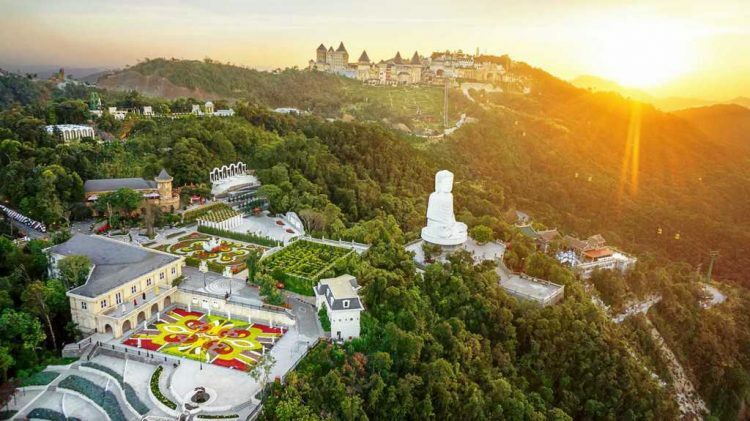 From the opening days, the Golden Bridge of Ba Na Hills Resort in Danang has created a fever among the local and international communites. It has recorded hundreds of thousands of check-ins in this majestic footbridge only after 2 months of its inauguration., The media houses are not yet tired; many newspapers, television channels such as CNN, Fox News, Reuters, Guardian continuously reported about the Golden Bridge. The famous press Bored Panda wrote: “Breathtaking bridge in Vietnam has just been opened and it looks like something from Lord of The Rings”. EconomicTimes described the Golden Bridge as a new phenomenon in Vietnam. NYTimes said that walking on the Golden Bridge was like walking in the clouds. Famous Instagram Travel Account @beautifuldestinations posted a photo of the Golden Bridge which has achieved over 500 thousand likes. This is a definitely impressive figure reflecting the global popularity of the fantabulous man-made structure. If you want to treasure your memories and experience of Golden Bridge Vietnam forever, the easiest way is taking some photos. Check-in is the trend of the youth nowadays. You can pick the most beautiful corner of this bridge for selfie and post them on some social media such channels like Facebook, Instagram or Twitter. On this Golden Bridge, you can enjoy the beauty of Le Jardin D’amour flower Gardens which was designed and developed as inspired by the French architecture, harmonizing between the natural landscapes and the climate of Ba Na Hills. Nothing better than having some pictures in such a orchestral background of colors, elegance and alluring beauty. Ba Na Hills has European styled climbing train to allow visitors enjoy different experiences along the rocky mountain. 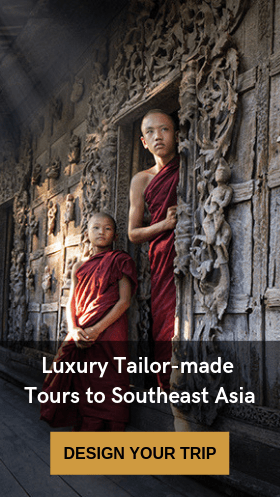 The climbing train takes a meandering way to ascend through the landscapes of Linh Ung pagoda, Le Jardin D’Amour flower garden, and ancient villas with luxurious designs of modern European architecture. You can join in a variety of entertainment activities such as climbing challenges at a height of 21 meters, the largest crash tram playground in Vietnam or Dinosaur Park – the only explorer area in Vietnam built in-house. The modern technology of 3D, 4D and 5D cinemas also gives you the most lifetime experience with 7D art. Moreover, a lot of fun recreational games here will help you feel relaxed and have fun moments with family and friends. Encompassing the Golden Bridge Danang, there are many beautiful places that you should not miss . This place is located on Chua Mountain, at an altitude of 1489 meters above sea level, about 25 kilometers from the center of the city. In the early 20th century, Ba Na was discovered by the French military while looking for new resorts. With a cool climate, and the average temperature around 18 degrees Celsius, Ba Na Hills is suitable for guests to enjoy the fresh air and scenery from above. 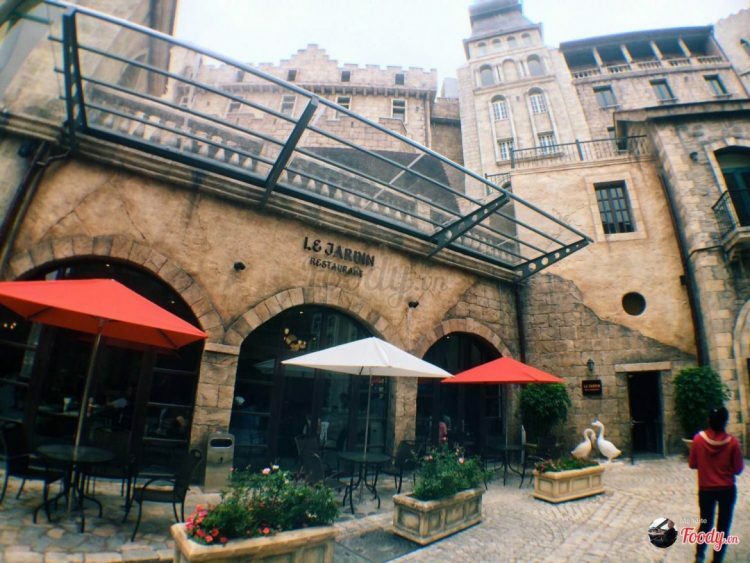 In addition, Ba Na peak also has a French village with spectacular Western architecture. Inside the themed village, there are many interesting games. In 2006, the Ba Na cable car system was set up and after its completion, it attracted a large number of tourists from all over the world. This attraction is 30 kilometers to the west of Danang city center. This stream has the cool climate and diverse flora and fauna. Suoi Hoa ( Hoa Stream in English) is the main source that provides water to the large lakes in Danang. From the top of mountain, you can enjoy the splendid view of many white waterfalls gushing into the ground creating a heavenly backdrop. The sprawling fields with dense vegetation and many kinds of forest flowers blossom to create a color palette. All of these make Suoi Hoa one of the charming tourist attractions for domestic and foreign tourists to visit in Danang. Suoi Hoa eco-tourism area is a place not to be missed for ecological tourists. Located on Highway 14G in the West of Danang, Hoa Phu Thanh is a unique ecotourism resort because of the combination of natural landscapes and thrilling games. 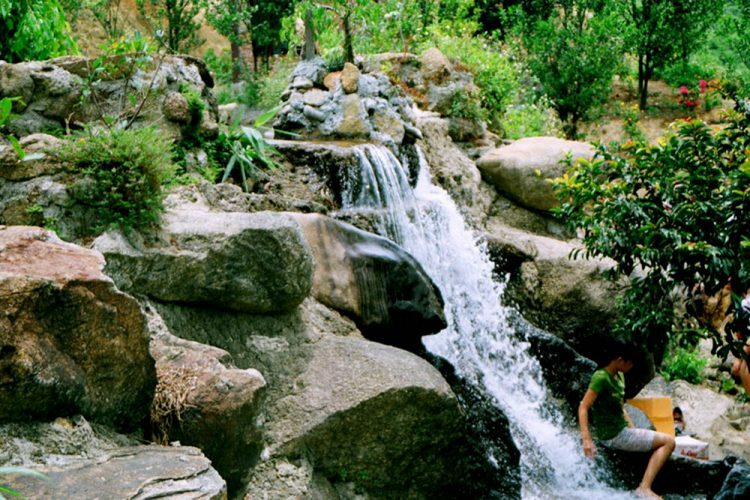 Coming here, youngsters can enjoy exciting games such as waterfall slider, zip line slider or fish massage. To have a complete fun trip, you can visit this place with your own a group of people to play games together. This attraction is located 8 kilometers in the south-east of Danang which includes 6 limestone mountains: Kim Son, Moc Son, Thuy Son, Hoa Son and Tho Son. 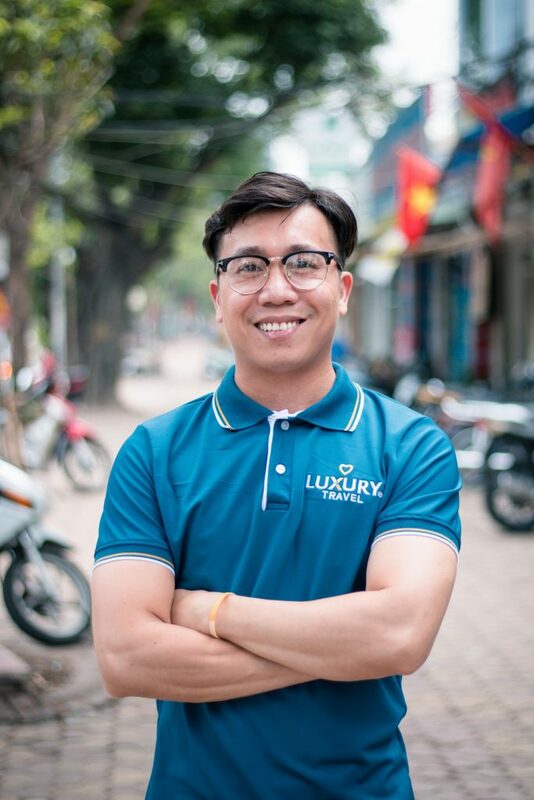 Ngu Hanh Son reflects the values of spiritual culture and traditional history of Central Vietnam. Thuy Son is the highest mountain with the height of 106 meters and there are many temples attracting a lot of visitors. Thuy Son has Linh Ung Pagoda, Tam Tam Pagoda, Tam Thai Pagoda and Tu Tam Pagoda. In particular, Tam Thai is the oldest pagoda that has the relics such as Huay Nghiem cave, Huyen Khong cave, and so on. After visiting Ngu Hanh Son, you can visit the Non Nuoc handicraft village. This place is famous for the products made from stone. They are very sophisticated and beautiful. Visitors often know about the beautiful destinations in Ba Na Hills and its impressive structures and entertainment. Few people know that this top resort in Danang has a diverse and interesting cuisine to satiate the taste buds of everyone. With a large and professional restaurant system, Ba Na Hills can meet the diverse needs of visitors perfectly. If you love the purest Vietnamese food, you can visit Cho Que cuisine area. This place is designed with peaceful and familiar ambiance, just like the countryside of Vietnam. Cho Que will be a “gift” for visitors who love nostalgia and romance. he price here is also very reasonable. 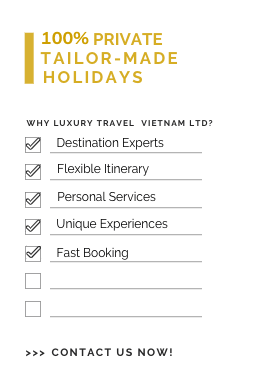 They range from VND 30,000 to VND 100,000. The most popular dishes are the pork rolls, pancakes, pasta, beef noodle and so on. 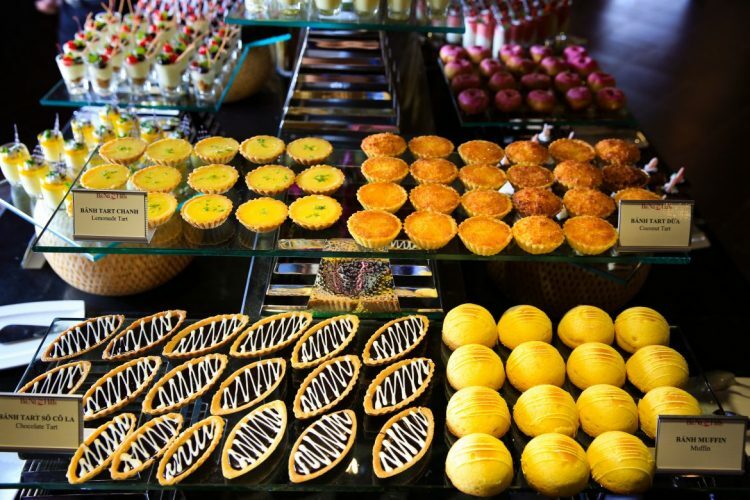 All are flavored with Vietnamese flavors according to traditional recipes. In addition, visitors also have the opportunity to enjoy the taste of European, American and intercontinental cuisine in the high-end restaurants. Prepared by famous foreign chefs, the dishes brings special flavors. Here are the lists of popular restaurants in Ba Na Hills. 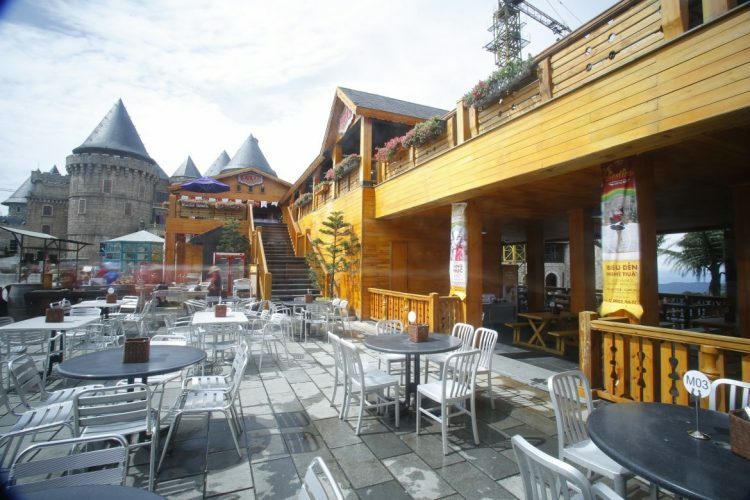 One of the top restaurants in Ba Na Hills is Kavkaz Vista Restaurant. Kavkaz Vista attracts visitors because of its unique stilt-style architecture. Furniture and accessories are decorated magnificently. It is designed as an ancient castle right on the floor above the Square Du Dômealong with the main color of avocado that makes Kavkaz Vista more luxurious. Not only from the inside, but also from outside, you can also see the whole large square. With a panoramic view, it gives you an unforgettable experience. This is like a miniature Russia in the heart of Vietnam. There are many famous dishes such as Russian salad, soup, salami, and cheese. Delicacies of fresh lamb are reminiscent of winter nights in the woods. Atrakhan sausage in the cool air is always the best. If you are a big fan of Japanese food, you can not miss Little Tokyo. This is one of the best restaurants in Ba Na. 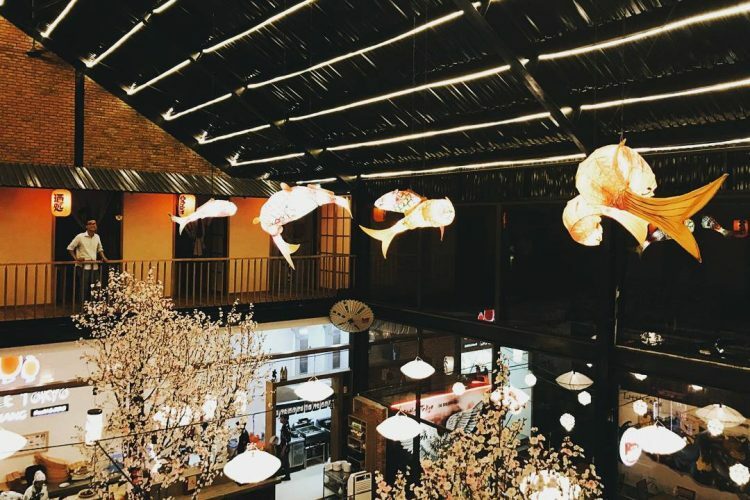 As the name implies, Little Tokyo is like a miniature Tokyo, from a restaurant layout to traditional food. It is widely designed with interesting Japanese symbols like Kimono dolls, koi carp and other decorative items in Japanese style. The restaurant serves with a variety of dishes in buffet style, cooked under the hands of talented Japanese chefs. Outstanding must-try dishes include sushi, sashimi: Chidori, spicy grilled salmon nigiri, grilled shrimp nigiri. The eating joint is described as an authentic French restaurant with elegant design and light tone. Le Jardin restaurant is quite spacious, and it has a balcony for you to fill your appetite overseeing the scenic beauty of the surrounding. . Like Little Tokyo, Le Jardin is also a buffet-style restaurant which serves French cuisine but the food here is a combination of dishes of three regions. You can also enjoy the traditional Vietnamese dishes such as beef noodle soup, rolls cake or hot aromatic barbecue. Dessert here is also evaluated beyond the expectations of guests. Restaurant space is the architecture of the three-story building. If you like the space to eat comfortably, the first floor is the priority for you. If you want to have a private space, the second and third floors are good suggestions. Not only fascinating tourists with the architecture, La Lavande restaurant impresses them with the specialties of the three regions. The food is always presented in an artistic way, and is always served hot to get the real flavors of delicious dishes.